Frequency of training is an often-debated variable when it comes to optimal delivery for performance enhancement. Determining the frequency of training runs parallel with the volume of training to allow adequate time for recovery after a training session. In order to maintain a high quality of work in the weightroom without detracting from performance on the field, there needs to be a restoration period. Just like volume, frequency has to account for an athlete’s age, training history, gender, and timing of the training cycle, as well as the goals of training. Add to that the athlete’s access to quality nutrition, recovery modalities, stress level, and sleep habits makes determining optimal frequency a tricky thing. Those of you working with high school athletes will have to add the drama of teenage relationships, homework, and non-sports-related activities to the equation. Most often, training frequency is determined based on an athlete’s schedule and the time of year relative to the competitive season. When all variables are ideal, three or four training sessions per week have proven to be effective in allowing for a better distribution of the training volume over the course of a cycle. When the competitive season arrives, there will be a reduction in the training frequency to account for the additional practices and games that cut into the recovery window. However, in our experience, less than two training sessions in a week has proven to be insufficient. Circumstances will always dictate the application, yet we have found those values to consistently work. During the off-season or with high-level athletes, or both, it can be beneficial to split a training day into two sessions. Particularly when the training volume and intensity are high, it can be valuable to split the day’s work into morning and evening sessions. This allows for a high level of performance between training sessions, better managing fatigue. Higher-intensity work can be separated from higher volume work during the day to allow recovery time in between and to maintain the quality of the work. Outside of professional athletics, it can be a challenge to schedule and consistently carry out split routines, particularly with high school or collegiate athletes. However, increasing the training frequency this way can be beneficial if you can do it. The greatest concern with increasing training frequency, whether through additional training days or split sessions, is over-taxing an athlete’s recovery. What can begin as steady gains in strength and performance can rapidly plateau and drop off a cliff if the training volume and frequency both increase too rapidly. Especially in the case of beginner or even lower-level advanced athletes, there should be at least one year, and ideally two years, of steady, progressive training at three days a week before advancing the volume and frequency to four days a week. You will never be wrong in keeping a high school athlete at three days per week; however, you can certainly go wrong in a hurry if you advance the training volume to the point of requiring four days too soon. The other question that arises concerning frequency of training is how often to train the same muscle or movement in a given week. The bulk of bodybuilding-driven programming ascribes to working a body part or region twice a week with a high volume to maximally tax the muscles and then allow for recovery from the workload to stimulate hypertrophy gains. 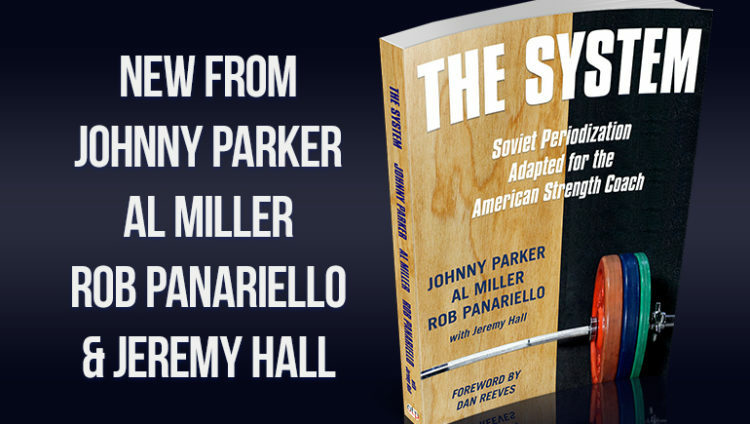 As we will show in subsequent chapters [of the new book, The System], training the same movement multiple times per week is a fundamental aspect of training for athletics. With planned variation in volume and intensity, we can stimulate improved strength and power gains and improved movement efficiency without the risk of overtraining. Success in training comes down to building recovery into the program from the beginning. [i] THOMAS, MICHAEL H., and STEVE P. BURNS. “Increasing Lean Mass and Strength: A Comparison of High Frequency Strength Training to Lower Frequency Strength Training.” International Journal of Exercise Science 9.2 (2016): 159–167. Print.